Surfstrand is made from corrosion resistant, spring temper stainless steel. Superior kink resistant. Camo colour finish minimizes reflection and disappears beneath the water. This is the wire I have used for ages, the 40lb is very thin for its breaking strain. Strong and reliable and does not rust. I'd thoroughly reccomend it. Comes in 30' spools. Sizes as per shopping cart options. 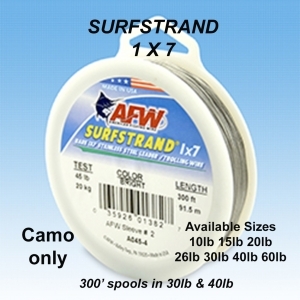 Also available in 300' spools.